Oil and gas industry is one industry that requires a long process, a high technology, high cost and even high risks that need to work. One such process is Petrophysics Interpretation or better known as the well logging. Petrophysics is the study of rocks and their interaction with the fluid (gas, liquid hydrocarbons, and other solvent). Meanwhile, well logging is the process of making the details of the physical measurements of the geological formations penetrated by the borehole. In doing well logging required components, such as main equipment (equipment drillers), the control room where the engineers works, computer units to digitize the data obtained, and the logging tools. Logging tools are an sensor to determine the physical properties of geological formations in the borehole which is divided into a variety of shapes (arm, pad, and mandrel). Based on the process of implementation, logging is divided into several types of open hole logging, cased hole logging, and even perforation and production logging. Well logging process can be reclassified based on where we put the logging tools, there wireline logging, logging while drilling, and tractor. The data obtained from the well logging process varies from depth, caliper, gamma-ray (GR), density (RHOB), neutron porosity (NPHI), sonic travel time (DTC), until the resistivity (R). Once the data is obtained from a wellbore, the data is processed by various measures. The step is the preparation of data, loading data, QC data, environtmental correction, preinterpretation and computation, parameters, volume of shale, porosity, resistivity or Rt true, water saturation and permeability. After all the process is done then the physical properties of the rock formations there and penetrated by the well where do logging can be known. Some of the geoscientist's career is a consultant; mining industry; oil and gas industry; geotechnical field; as academics; and in the administration. A geoscientistgetting productive when he is 8 years since the beginning of learning in the lecture. In employment, the important thing is the soft skills, including how to communicate with others. This guest lecture was started at 08:30 A.M. The course was collaborated with AAPG Student Chapter and SMIAGI Student Chapter. Participants who attended came from University of Brawijaya. The event was succeeded, the speakers give quizzes for students. Short course share knowledge about Seismic Interpretation for Structural & Stratigraphic Trap. The seismic data is a data obtained by firing the seismic waves in the Earth's surface. Seismic divided into two seismic refraction and seismic reflection. Instrumentation in seismic acquisition is vibroseis, geophone, dynamite, labo and cable. In seismic acquisition there are two obtained by the signal and noise. Data from the acquisition seismic still contain signal and noise. Signal and noise is what will be processed to become the seismic data to the noise and there are only a signal that shows the subsurface geological conditions. Signal is a case that shows the geological conditions that exist below the surface, while the noise itself is harmful because it indicates something that is problematic. Noise it self must be removed at the time of processing seismic data. This short course was held on May 7th, 2016 and started at 08.30 AM. 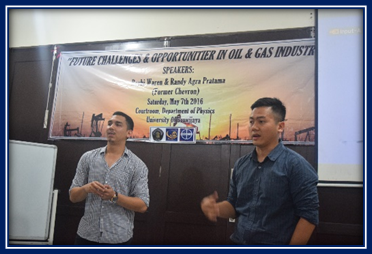 The short course planned to be performed by two speakers from Chevron with the topics Future Challenges & Opportunities in Oil and Gas Industry. Oil resources in the world can be represented by a pyramid model. Where conventional oil resources are at the top of the pyramid while the modern petroleum resources exist on the base of the pyramid. Getting to the bottom of the pyramid opportunity, but also the greater uncertainty. Given this pyramid allows the pro and of conventional oil resources and modern. This guest lecture was started at 08:30 A.M who held by AAPG Student Chapter and EAGE Student Chapter. Participants who attended came from University of Brawijaya. The event was succeeded, the speakers very excited with enthusiastic from participant. This event was a great opportunity for the participants to learn more about new venture in oil and gas industry. The speaker gave course about the basic concept to open a new company in the world oil industry. We are too not enough to called perfect. We still have many things should be repaired. Even sometimes we feel the pains of falling through our way. But, we are walking together. Holding hand each other. Trying to be better, to get the best we can reach. To carry out anything we can do. Surely we can not act as an arrogant unity, that only want to showing up their superiority. We just a small family that want to help the world by using our simple-little steps. All we can do is give with no receive. Because we can not be selfish. And we will drowning soon, if we just keep quiet with no action. So, lets think Big, start small. Please contact us on the given link or mail if you have anything you want to ask us or critics about our work programs. There were 3 main topics that discuss in this course which are Basic Exploration in Geophysics, Pertroleum Geology and Formation Evaluation. Exploration is the search for commercial deposits of useful minerals, including hydrocarbon, geothermal, resources, etc (Sheriff,1990). Geophysics has an important role to search for new energy resources, especially for oil and gas industry geophysicist use Seismic method. The agent of change in Seismic method are noise, acquisition, and earth effect. In seismic interpretation, knowledge of rock physics is used to understand the relations between the physical properties of reservoir rocks and seismic properties by applying forward or backward modelling technique.The three main physical properties of the reservoir rocks are the matrix, the porosity, and the fluids filling the pores, whereas four main seismic properties are amplitude, reflection time, phase, and frequency. Source rock: Rocks that has actually generated & expelled hydrocarbons usually fine grain sedimentary rocks. Mayor types of source rock : shale, cosl, marl, and carbonate. Reservoir rocks: Permeable & porous rocks which is filled by hydrocarbon & water in its pore. The rock could be : sandstone and carbonate or other rocks such as shale, volcanic rocks, farctured basements. Cap rocks: Impermeable rocks medium that isolates a reservoir and retains petroleum. Example: shale, anhydrite, gypsum, marl, etc. Traps: Geologic features in which petroleum can accumulate. Structural, stratigraphic or combination. • Porosity is the ratio between the empty space of a rock to rock volume itself. • Saturation is the ratio of the volume of a fluid in the pores of the rock where the fluid is. • Saturation of water in a rock is the large volume of water than the total volume of the rock pores.